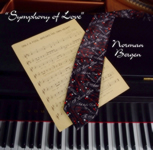 To purchase Norman's new CD "Symphony of Love" click here. Alright, you get the idea. I am very happy to welcome people from all over the world! I have been a professional musician since my teen years in the late 1950’s and early 1960’s. I have since been involved with virtually every style of music in various capacities, and am fortunate to have worked with some amazingly talented people. I have always enjoyed listening to music, and creating and performing it for people who enjoy music, rather than for some of the music industry types who often have different priorities. Luckily, I have been more successful with the listening audience than with those behind the desks and I hope that some of my work has brought pleasure to you over the years. I have seen much information on the internet about music with which I have been involved: some correct, some not. I have been credited for work that is not mine, and at times have not been credited for work that is. Here I can dispel myths (hopefully not misspell) and answer questions. This website is here to share some musical history with family, friends, including those new friends among you whom I have not had the opportunity to meet. My memory is not perfect but I remember much, and will do my best to share some of my experiences to the best of my recollection, and in my own words. I hope you will find it both informative and fun. Enjoy! Like Norman's Facebook pages and stay up to date.